The Trump administration and governments in Ottawa and Mexico City have indicated they will renegotiate the trilateral, quarter-century-old North American Free Trade Agreement (NAFTA). While the existing accord enjoys the support of roughly three-quarters of the Canadian public and six-in-ten Mexicans, it is viewed less favorably in the United States, with Republicans far less supportive than Democrats, according to a new Pew Research Center survey of all three countries. 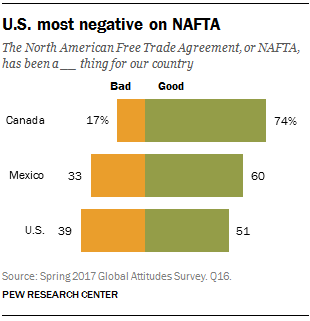 About half of Americans (51%) say NAFTA has been a good thing for the U.S., including 11% who say it has been very good. That compares with 74% of Canadians who say the agreement has been good for Canada, including 20% who say it has been very good. Among Mexicans, 60% see NAFTA as being good for their country, including 10% who hold that view strongly. These differences in views may, in part, reflect the fact that both Canada and Mexico run merchandise trade surpluses with the U.S. In 2016, the U.S. ran a collective $74 billion trade goods deficit with its two NAFTA partners. Political partisanship is linked to views of NAFTA, most notably in the U.S. About two-thirds (68%) of Democrats see NAFTA as good for the U.S., while only 30% of Republicans hold that view. And intensity of sentiment differs widely along party lines: While 33% of Republicans believe NAFTA has been very bad for the country, only 6% of Democrats agree. Public support for NAFTA is somewhat higher today than it was in 2005, the last time Pew Research Center and Gallup regularly polled about the agreement. And after a decline in support for free trade agreements in general during the 2016 campaign, a plurality of Americans support them again, according to a separate 2017 Pew Research Center survey. In Canada, large majorities across the political spectrum support NAFTA, according to the Center’s new survey: Conservatives (83%) and Liberals (82%), as well as supporters of the New Democratic Party (70%), say it has been a good thing for Canada. In Mexico, 68% of those who identify with the National Action Party (PAN) believe NAFTA has been a good thing for Mexico. A smaller majority of Institutional Revolutionary Party (PRI) supporters (59%) agree. Canada and Mexico are the two largest destination countries for U.S. exports and the second- and third-largest sources of imports (after China), according to the latest Census Bureau report on international trade in goods and services. In 2016, Canada and Mexico together accounted for a little over 26% of total U.S. exports of goods and services and 23.5% of total imports. Aside from crude oil and other fossil fuels, which were the second-biggest imports from Canada last year ($54.2 billion), the largest categories of exports and imports to and from both Canada and Mexico are similar: motor vehicles and parts, heavy machinery and electrical and electronic equipment – an indication of how closely integrated the three nations’ economies are. In addition to their party differences, Americans differ about NAFTA along gender, age and racial and ethnic lines. Women (55%) are more likely than men (46%) to believe that the trilateral trade agreement has been good for the U.S. And about twice as many men (25%) as women (12%) say NAFTA has been very bad for the country. Roughly six-in-ten (62%) Americans ages 18 to 29 – who were children or not even born when NAFTA was signed – voice the view that the trade deal has been good for the country; only 26% see it as bad. Those ages 50 and older lean in the opposite direction: 44% see the accord positively, while 49% see it negatively, including 22% who believe it has been very bad for the U.S.
Hispanics (66%) and African Americans (59%) say NAFTA has been good for the U.S., but just 46% of non-Hispanic whites agree. Correction: This post and the accompanying charts “U.S. 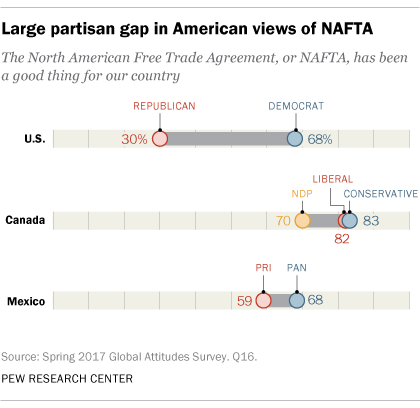 most negative on NAFTA” and “Large partisan gap in American views of NAFTA” were updated May 10 to reflect revised weighting of Canada survey data. Note: See revised topline results of our survey and methodology. The survey was conducted Feb. 16-March 15 in the U.S.; Feb. 16-March 3 in Canada; and March 2-April 10 in Mexico.